Are you familiar with craft subscription boxes? If not, let me introduce you to the joy of receiving a box full of crafty-tinkering science-art goodness in the mail each month. This may seem like an odd post for me since, if you’ve been following the blog for a time, (which, by the way, makes you a very special person) you are aware that I am not the craftiest mom in the crowd. Finding said craft via Pinterest or book. Convincing my kids that crafting is a more worthwhile activity than Pokemon. Find time to do said craft. Convince the kids to see the craft all the way to the finish line. Find a place to store said craft until the kids forget about it (doesn’t take long) and I can toss it. Can you see why there is not much crafting going on around here? However! We are now hooked — hooked, I tell you! — on a certain crafty subscription box for kids. Before we go any further: I’d like you to know, I purchased the product myself! Kiwi Crate is not sponsoring this post, but the Kiwi Crate brand links in this post are affiliate links. They often run specials, like this current 30% off deal. For about a year I have been eyeing Kiwi Crate and after dragging my heels I finally ordered a subscription box to try out. I ordered the original Kiwi Crate for my almost 6 year old and the Tinker Crate for my almost 10 year old. The first Kiwi Crate (ages 4-8) was a wild west theme. It included several crafts, plus an activity book. The best thing about the crafts was that they were active crafts! New Kid loved making his own hobby horse and then riding it around. After making bean bags, he played a toss game with his brother. I was so, so happy with how willing he was to put his fine motor skills to work sewing up the bean bags and even cutting out the stand-up puppets. Normally he hates using scissors, so I was ecstatic about that. Kiddo received the Tinker Crate, a STEM themed subscription box for kids ages 9 and up, perfect for his interests right now. It was sort of amazing. Kiddo put together a motor! He was so excited when he got it going. UPDATE: We’ve made so many projects now, including this STEM toy gravity game, and this LED Luminary! The instructions are easy to read and follow. Kiddo has a physics kit and the instructions are TERRIBLE. He never bothers with it because it is so poorly written. 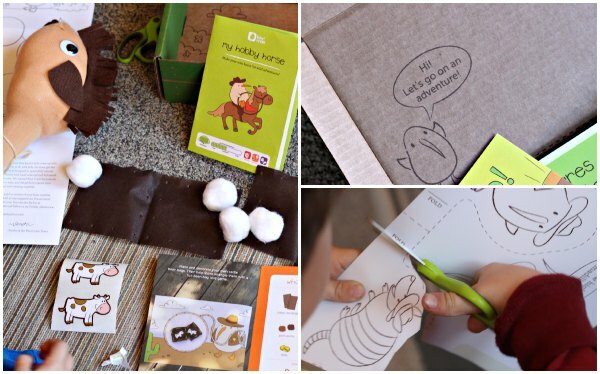 The craft and tinker box each come with an activity book for extension projects. I especially love the Tinker Crate book, with its explanations about how electro-magnetism works, and further experiments to try. In fact those extra experiments use the items already in the kit so I don’t get stalled on step #2 yet again! Each month’s box is different. This month our Kiwi Crate has a wild west theme, but last month it was all about castles and building a catapult. Our Tinker Crate got Kiddo to build a motor, last month kids built trebuchet. These are crafts I don’t even want to toss away! We keep all parts tidily in the box to explore when ever the mood strikes. 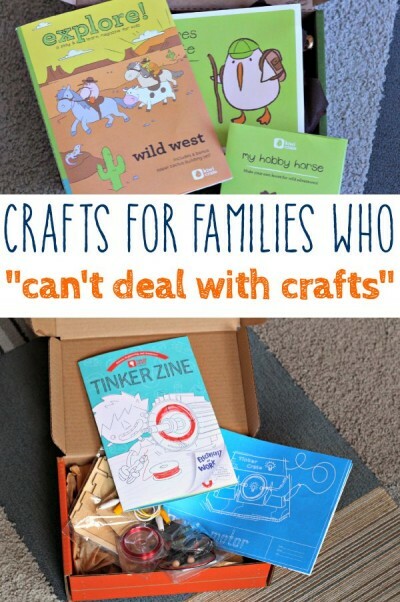 Take it from this Non-Crafty Mom, you will adore Kiwi Crate and Tinker Crate. Do your kids have a subscription? How do they like it? Can you tell I absolutely love it? What a great idea. I wish there were subscription boxes around when my Kiddo was young. She wasn’t the craftiest kid on the block, but liked doing them. Thanks for letting everyone know about this. I would have loved getting something like this when I was a kid, too. Raddish Kids is another great subscription box for cooking with your kids. Great recipes and easy to follow instructions for the kids. http://www.raddishkids.com/ Each box has 3 recipes, a kitchen skill to learn, creative activities and more. Thanks for the recommendation. I will be sure to check it out. I do set up a lot of crafts with my kids – but these seem like great self-contained ideas for when we go to grandma’s house or on a vacation. I usually pack up some crafts to take along for rainy days or spots of boredom – how easy it would be to just bring a crate like these instead! And I was thrilled to see that they offer a “sibling add-on” option so you can request extra supplies for each child and avoid jealousy! Oh, that is a great idea! Taking it on a trip is a fantastic way to use it. I loved the sibling add-on, too! Totally genius of them to offer that option. I love crates! Despite being very crafty myself, it was a nice treat to have everything ready-to-go, and good quality supplies too! We got a couple of Kiwi crates, but alas the added shipping to Canada made it not feasible to continue. Oh, bummer about the shipping. Ooh!! thanks so much for this idea. I’m totally sending it to the grandparents for xmas gift ideas! Good idea! I hope they enjoy it. Looks like an amazing subscription box! I love these pre-made crates, too. It’s as fun for me to see what comes inside of them as it is for my kids. There’ that whole ‘getting something in the mail’ factor that makes them extra special. And Kiwi Crate has GREAT ones they’ve put together. These are great! 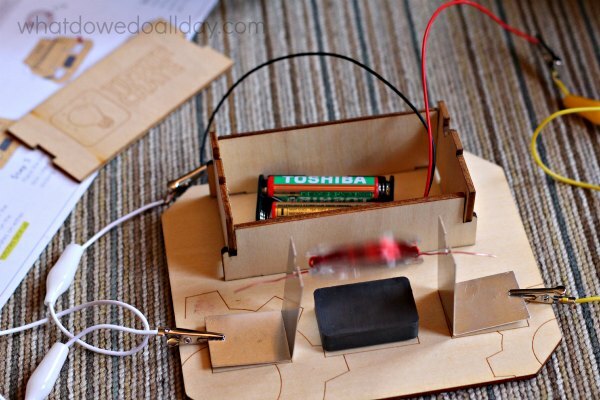 I love ways to get kids interested in engineering, looks like the Tinker box is a great way to do that. Thanks for sharing! We love Tinker Crate so, so much! My son really loves the Tinker Crate, I think it is great we can get STEM activities mailed to our home. Thanks for sharing your experiences.